According to Native American legend, Devils Tower was the home of a great bear. Its "claw marks" can still be seen today. Traveling between Yellowstone National Park and the Black Hills of South Dakota gave us a great opportunity. We’d to stop off for a few hours to see one of the most iconic sites in the western US. We were grateful to visit the first US National Park (Yellowstone), and the first US National Monument (Devils Tower), in the same week. Grateful for a journey slow enough to bookend an epic week of travel with two such significant spots. Big ups for being slow. And big ups to Wyoming for being awesome! Devils Tower is part of the Bear Lodge Mountains in Wyoming. The Bear Lodge Mountains are actually part of the Black Hills. We’ll head into the South Dakota section of the Black Hills several times over the next few days. But, our official intro would be marked by this epic butte! There were plenty of opportunities to photograph the tower in the distance, for several miles before we reached the park. 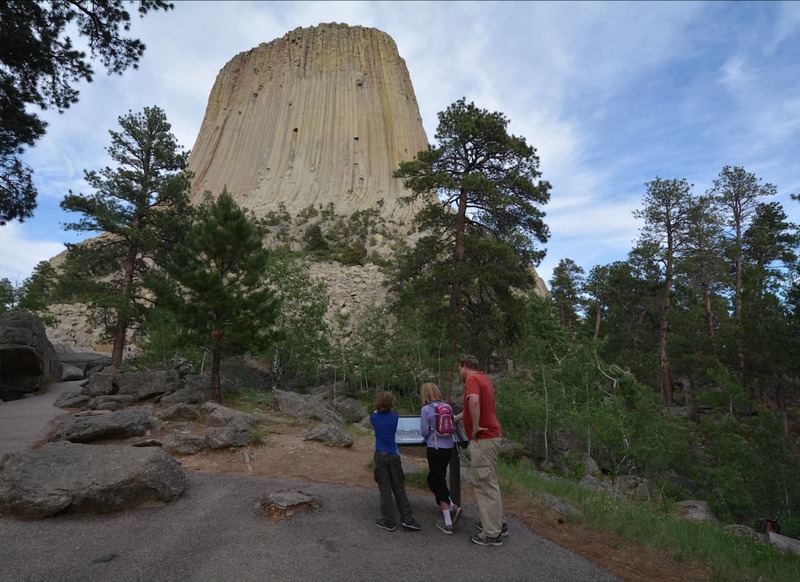 Devils Tower is visible for miles leading up to the entrance of the park. As per usual, we stopped at the visitor center first. There were multiple trails available for hiking, but only one which circles the tower itself, Tower Trail. Its your best and only choice if you have just a few hours to see the park. It offers the closest views of the tower, and of any climbers who might be out (up) making a day of it. 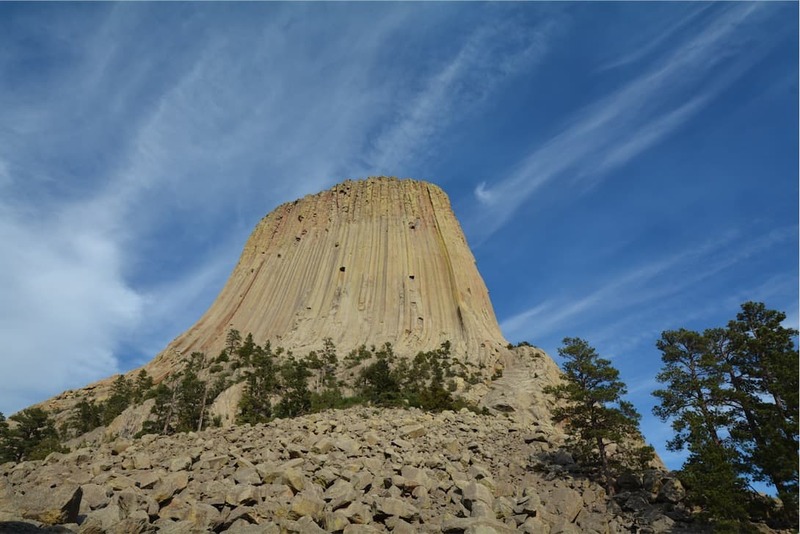 Over the years, Devils Tower has become very popular for rock climbing. Climbers come from all over the world to scale it. At times, they’re so high up, that they can hardly see them. Pause. Slow down. Scan the tower, up and down. You’re bound to find them. Looking at the tower, I flash back to some of my earliest childhood memories. That’s right, seeing Close Encounters of the Third Kind in the movie theater. I was all of three years old, but I can actually remember much of the experience. Who doesn’t immediately recognize the five-tone sequence of notes used in the classic penultimate scene of the movie? And, of course, there was the mountain of mashed potatoes built by Richard Dreyfus to look like his vision of, you guessed, Devils Tower. Today, we’d be having our own close encounter with what Native Americans call Bear’s Lodge, or Home of the Bear. In Indian lore, the igneous columns which give the tower its texture, were the outcome of a great bear scratching its way up the tower. Scientists believe the tower is actually a column of cooled lava that came into existence millions of years ago inside of a live volcano. The volcano itself, and other sedimentary rock that may have been hiding the tower, have since eroded away. However, the influence of a million years of rain, snow, and ice couldn’t erase the tower itself. 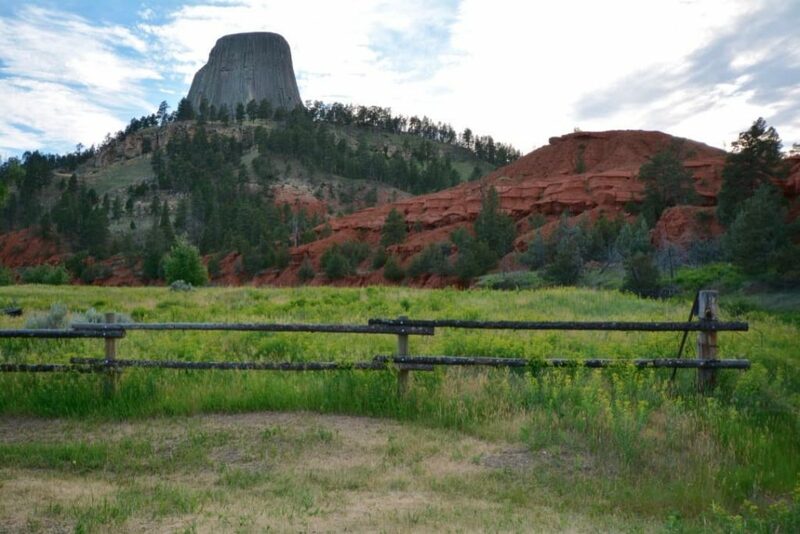 According to Native American legend, Devils Tower was the home of a great bear. Its “claw marks” can still be seen today. Here’s an aerial photo of Devils Tower that provides some geological context. Notice, what scientists believe is the shape of the original volcano encircling the tower. 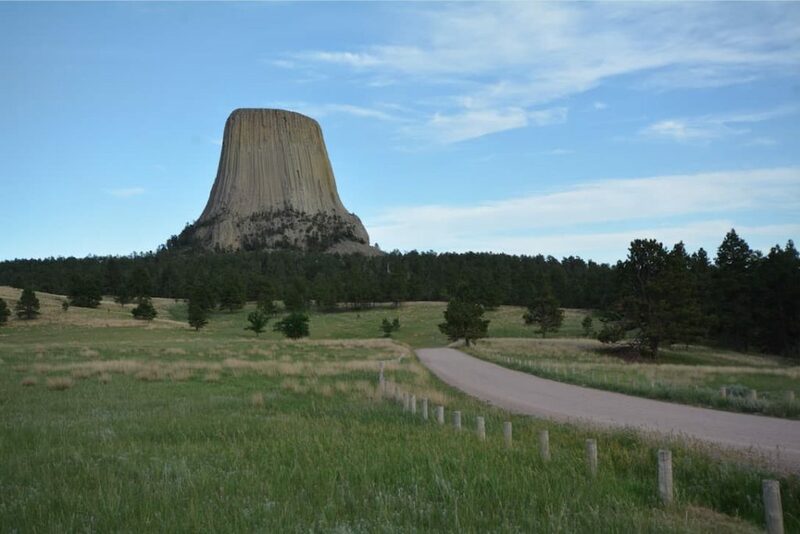 However it came to be, Devils Tower is truly an astounding site. The mind reels as it tries to grasp the tower ascending to the sky. We highly recommend that you come here and be astounded, too.